After my exertions on the first day of my North Cornwall trip I slept fairly well, even without my own duvet and pillow. I think the bottle of Doom Bar probably didn't do any harm either! I’d set my alarm for 6.45 ready for a day of not stop photographic action. By 7.30 I was out of bed stuffing complimentary biscuits down my mouth whilst trying to pack my camera gear. 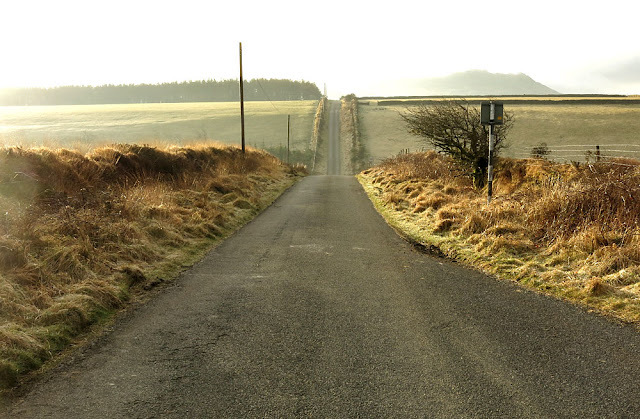 The road to Roughtor. Possibly the straightest road in Cornwall! Ten minutes later I was leaving Camelford and heading along Roughtor Road, which would hopefully lead to Roughtor on Bodmin Moor - Cornwall’s second highest point. 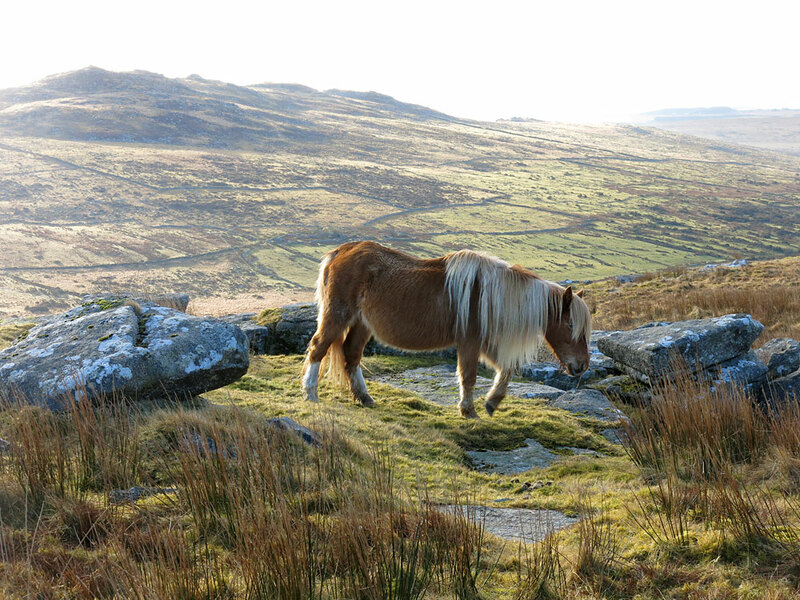 Those of you familiar with Cornish country lanes will notice Roughtor Road is a little different. Yes, it is completely straight. Well in the horizontal plane at least, it does have a few hairpin ups and downs. All the time I was driving I could make out the mist enshrouded form of Roughtor a mile or so away. The light was amazing, reminding me why other, proper, landscape photographers get out of bed early. Upon parking the car I was met by a solid wall of moor ahead. This didn’t deter me, what did was the boggy ground ahead. Actually it wasn't too bad and soon I was stomping up to the summit of Roughtor, crunching through icy puddles and getting disdainful looks from sheep. Nothing to do with the sheep noises I was making at them. Once at the top it was time to scrabble around on the rocks and find some interesting ones to photograph. 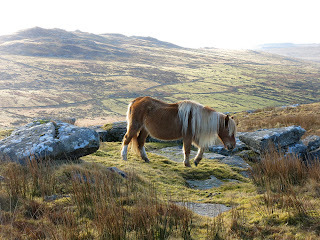 There were also a few very disinterested ponies up there too. I tried to engage them in conversation but they were not interested at all. The view from here is pretty good, you can see to the coast but the views back to the moor and Brown Willy are the best. Realising it was almost breakfast time I headed down the slope as fast as I could - more alarmed sheep! At the bottom of Roughtor is the Charlotte Dymond memorial who was murdered here in 1844. Her boyfriend Matthew Weekes was hung for her murder but it is still debated whether he was guilty or not. After doing the breakfast bit of my B&B I headed off in the other direction to the coast. 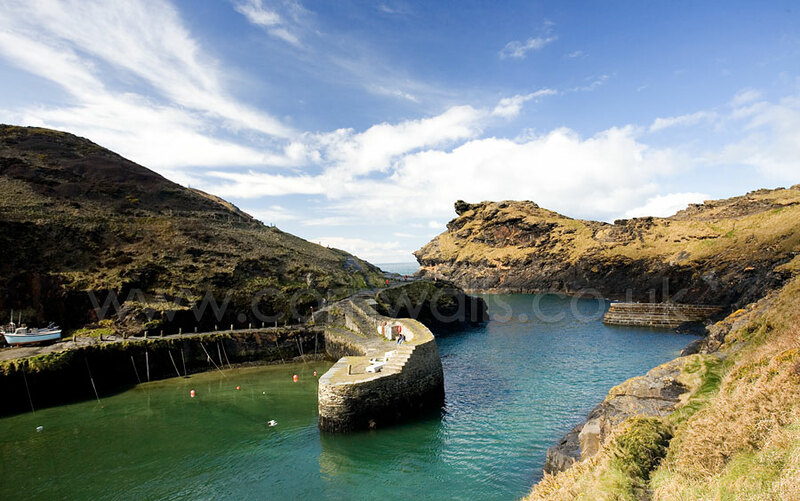 Boscastle is one of my favourite places up this way. A deep valley cut by the River Valency leading out to sea between two imposing headlands. I've been to Boscastle a few times but never managed to get any good photos because either the sun was in the wrong places, there was no sun at all or the tide was out. However, this time everything was in alignment. It was a particularly lovely morning. From being on Bodmin Moor with frozen puddles here I was in sunny Boscastle in just my woolly jumper (and trousers etc). There were a few other people pottering around the harbour and the day had a nice feel to it. My biggest disappointment was there were no boats in the harbour. 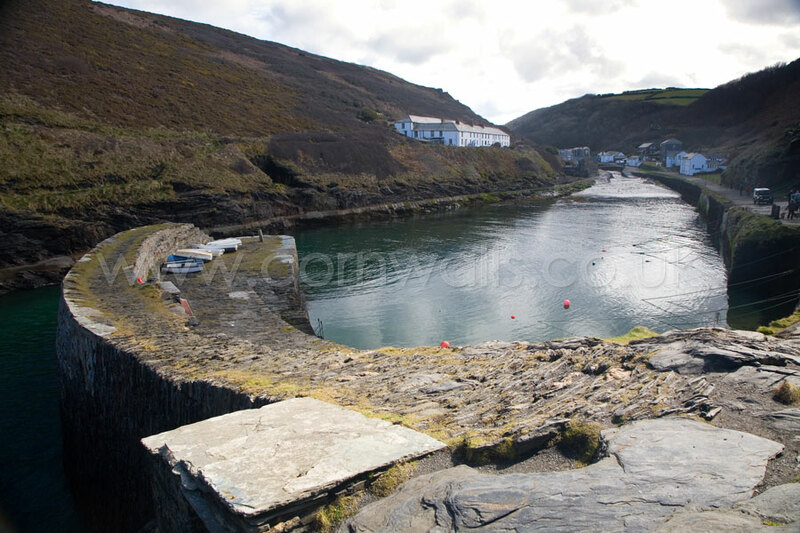 I mean, I came here to take scenic photos of Boscastle harbour and no one thought to leave a boat bobbing around for me! Still, I managed to get some very nice shots around the harbour, including one that at a squint looks a bit like a Scottish loch. After a quick walk up to see the view out between the headlands I realised I was going to have to climb something, for some reason I always have to get to the top of something. Not sure if this is a male thing, but anyways, this time it was Penally Point on the other side of the harbour. Off I set, across the new bridge and along the coast path. It didn’t take long to be near the end of the point when suddenly I realised where I was and that it was a long way down. At this point I started feeling a bit queasy, snapped a couple of quick photos and retreated back to the coast path staying as low to the ground as possible. With Boscastle “done” I had another place I’d been meaning to tick off the list for a while - Bossiney Cove. I’d had a look the previous day when I was at Rocky Valley, I must have practically tripped over the little cove but still managed to completely miss it. So, today, armed with a crystal clear mental picture of where it was, I jumped in the car. I parked up in the village of Bossiney and headed down a muddy track sing-posted “to the coast path”. A few hundred squelchy meters later I was on the coast path at what I assumed was Bossiney Haven. I did think to myself there wasn’t much of a beach here but decided it must disappear at high tide and began snapping away as it was very pretty. Most impressive were the huge sheer cliffs across the little bay, over 300 feet straight up. Anyway, it turns out this was not Bossiney Cove at all, it was in fact Gullastem. Bossiney Haven actually nestles in the shelter of the far side of those huge cliffs. Mental note to self; buy a proper map. A raven. Probably the reincarnation of some Arthurian character! 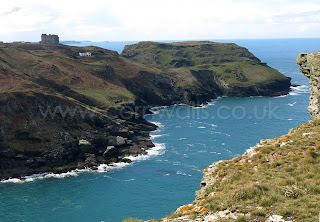 Where ever I was there were great views back along the coast to Barras Nose in Tintagel. For some reason, my dislike of heights drew me towards those cliffs on the other side of the cove so I stomped along the coast path to Willapark and out onto the headland. The footpath is a good few metres from the cliff edge and I had the odd sensation of being simultaneously drawn and repulsed from the cliff edge. 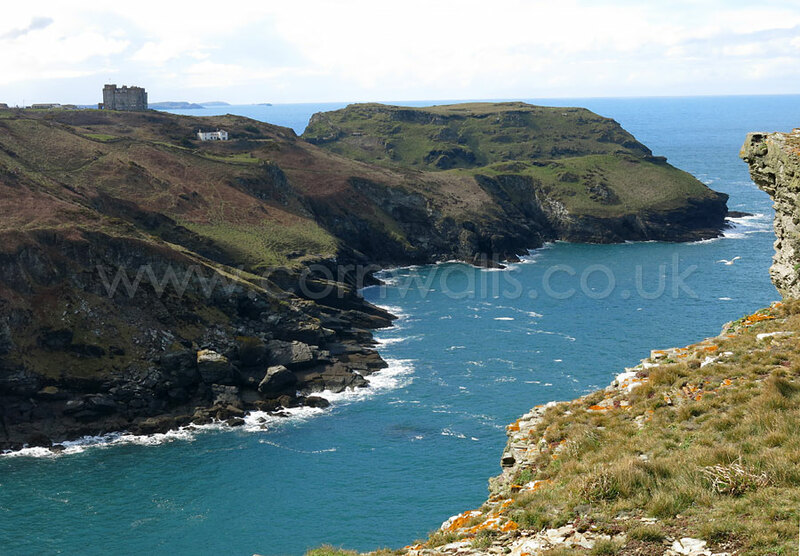 As you would imagine this area is a haven for wildlife and the cliffs are a nesting spot for a host of sea birds. I did hear a bird of prey somewhere down there and guessed it might have been a peregrine falcon as they like the cliffs. 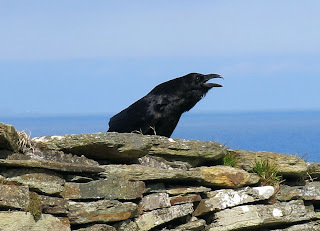 What I did see was a raven sat on a dry stone wall making its guttural clicking call.